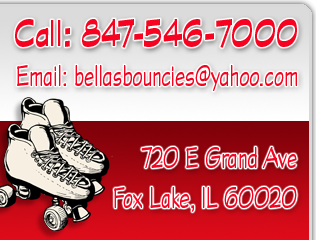 Open skate and bubble soccer times, and admission prices, are below. Admission does vary by day. There is no charge for parents that choose not to skate. Anyone under 18 that is not accompanied by a parent will be charged admission. Bubble Soccer times are marked as bubble soccer. All other times are roller skating times. The schedule is updated frequently to reflect the most accurate times. Skate rental is extra. Regular skates: $2.00 per person. Speed skates & rollerblades: $4.00 per person. Skaters are allowed to bring their own skates or roller blades, but they must be clean and in good working order. The skates must not have any protruding nuts, bolts, or sharp objects for everyone's safety. 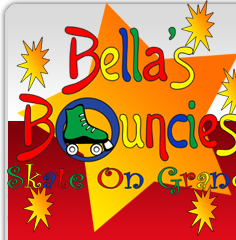 Personal skates and roller blades will be inspected by Bella's Bouncies staff and are subject to their approval. Bubble Soccer is played while wearing shoes. Each player must wear non-marking, properly fitting, athletic shoes. See Bubble Soccer tab for additional information. Everyone must complete a waiver to participate in Bubble Soccer. CLICK HERE to complete it now, or use one of our tablets when you come in. Parents must complete it for any minors. $25 includes admission and standard skate rental. $40 with a large 16" pizza and pitcher of soda. Family 4 pack must consist of at least one parent. Additional family members at the regular rate.